If you’re interested in growing your net worth, you’ve probably considered investing in rental properties. After all, rental properties are one of the most time-tested sources of passive income. Property value gain should you decide to sell in the future. Many people avoid real estate investment because they think being a landlord is time-consuming and stressful. But in reality, day-to-day management of real estate property is quite simple and can be done almost exclusively with a Rental Property Spreadsheet. Use them to spark ideas for your own ultimate rental property spreadsheet. After you’ve made the decision to invest in real estate, you must decide on a location. To increase your chances of having the property rented at all times, you’ll want to consider factors important to renters, such as the local economy and school district quality. Every property is inherently unique; consequently, you need data that enables an apples-to-apples comparison, such as price per square foot and tax assessed value vs. list price. For single-family homes, this data is easy to find on a real estate site like Zillow; for a commercial property, you’ll want to talk to the real estate agency selling the property. Why is the price per square foot so low or so high? Why are the property tax rates so different? Is the owner of one of the properties receiving a special tax rate that you could take advantage of? Why is the list price so different from the tax assessed value? Are the assessments in the area generally high, or is the owner trying to liquidate the property quickly? When narrowing your list of prospective properties, it’s important to understand the purchase price of a property isn’t the total amount you’ll pay to become the owner. Immediate repairs, estimated closing costs, and estimated property insurance rates should be factored into the purchase price to accurately compare the properties you are considering and to make sure you have adequate funds to finalize the purchase. In addition, you should estimate the cost of managing each property by calculating the cost of utilities, the monthly mortgage payment, and any other planned expenses, such as mowing and trash removal. With this information in your rental property spreadsheet, you can calculate how much rent you need to charge for each property to break even, and decide if you can reasonably make money from the property based on local rent rates and your break-even point. Note that expenses which do not occur monthly should be estimated on a monthly basis to get an accurate estimate of each property’s profitability. At this point, you should have a good idea of the estimated total cost and estimated net profit of each property and should be able to make an informed decision regarding which property to purchase. After you purchase a rental property, you need to manage the day-to-day rent collection, bill payment, and upkeep. You could hire a property management company, but doing so could swallow a significant portion of your rental income. At the very least, you want to record your tenant’s contact information, the property in which they live (if you own more than one), the start and end dates of their leases, and when they make rent payments. Using a rental property spreadsheet allows you to track this information without maintaining files of information on each renter. Through the magic of Google Sheets, you can create a link to your tenants’ leases for easy access should you ever need to reference it. Unfortunately, you can’t link to local drives on your computer, so any document you wish to add to your spreadsheet has to be saved to your Google Drive. Once your document is in your Google Drive, you can create the hyperlink within your sheet. Click on the cell you want to hyperlink. Begin typing the name of the document saved in your Google Drive. If your spreadsheet nerdiness is truly off the charts, you can create a link to a tenant’s email address that will automatically open your computer’s email app and begin a new email. The steps are the same as above, but instead of choosing a document, you will type the tenant’s email address into the link field. Finally, you need to keep track of when your tenants pay rent. Most landlords require rent to be paid by a certain date, or the tenant will be charged a late fee; therefore, you need to know when your tenants pay rent to know whether they owe the fee. Maintenance is one of the most costly aspects of owning property, and maintenance requests are not created equal. A roof repair is a high priority, but it is expensive and could take a few weeks for the work to be completed; on the other hand, a leaky faucet is inexpensive to repair and can usually be fixed in less than an hour. You need to track which requests are most important so you can be sure to address the most pressing issues first. If you sort your records by date and filter by requests that have not been completed, you can easily see which request to handle next. You can further indicate the importance of a request by clicking on the background color icon in the shortcut menu and changing the color of the cell. Be sure to keep track of which repair and maintenance businesses you prefer to use so you don’t have to search for their contact information each time you need it. 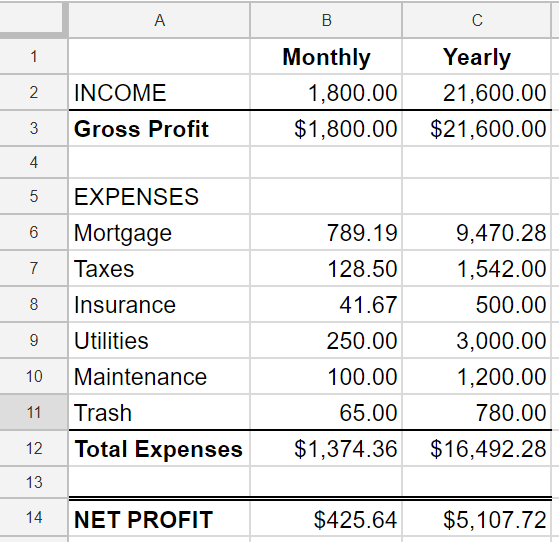 Finally, you need to track your income and expenses, which can be done with the new Tiller business template. The template has a handy dashboard displaying in-depth information about your income and expenses; this is particularly useful when deciding if you should raise rent prices or whether you can afford more expensive repairs. When tax filing season rolls around, you can easily generate a Profit and Loss report to give to your tax professional. Tiller also has a reminder spreadsheet that will automatically send you email reminders when you have an upcoming bill due. Adding the spreadsheet to your business template will ensure you never forget to pay your rental properties’ bills on time. Cultivating passive income streams is the quickest way to achieve financial independence. 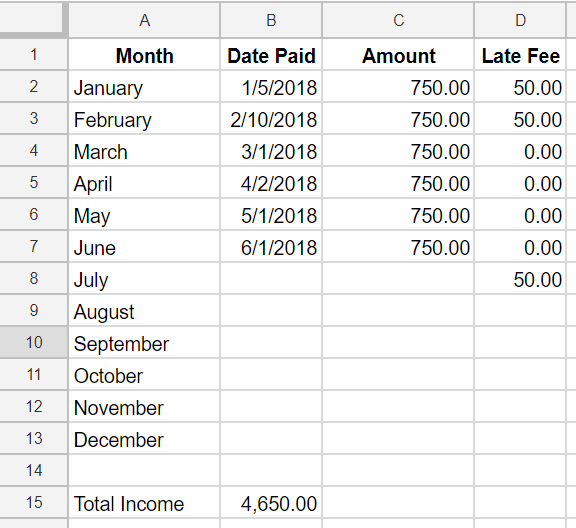 While it can be expensive to purchase a rental property, the day-to-day management can be done for free with a rental property spreadsheet, making real estate a viable path to passive income.